I was recently in Florida. It's a place that fascinates me. I love the panther crossing signs on the road among other weird things. 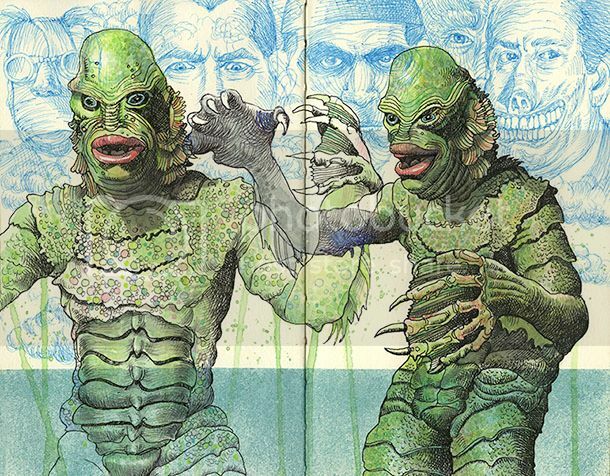 I was on the beach drawing this rendition of the Creature from the Black Lagoon. My cousin Steven, informed me that the movie was filmed in Florida. Somehow that made total sense when I heard it. I may not be, the retire to Florida type, but I am, the go to Florida once or twice every winter type. And we love having you! Thanks for coming and I think those guys live in my back lake. Love all the blue vintage "monster movie" guys in the background too.